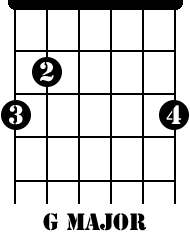 Of all the basic guitar chord progressions, I didn't think it would be difficult to find songs for the G-C-D progression, but it was NOT easy! Maybe I just didn't "cast the net" far enough out. It seems the G-D-C progression is a lot more popular with writers and performers. Anyway, not to worry – I dug up some classics. 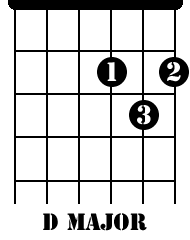 This is a pretty basic guitar chord change-up. It's a bit easier with the bar chords instead of playing the open chords, but with some tunes you'll get a better rendition of the song with the open chords. Another example of the G-C-D progression is the chorus in "Lucy In The Sky With Diamonds" by The Beatles. This is a pretty complex song, so for now, let's just recognize that our chords are used in the chorus. Here's a hit song by Lennon/McCartney recorded in 1965 from the "Help!" album. The G-C-D progression is used for the chorus roughly with Dsus included in the mix. Of course you'll recognize the G-D-C progression from the last lesson we studied – The Beatles start this song with the G-D-C progression then swap the D and C chords for the chorus. Let's take a look at the tabs for "You've Got To Hide Your Love Away" by The Beatles. 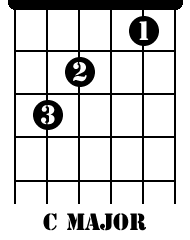 That should be a good start for basic guitar chord progressions.